Over the past many years, I have tried several things to "change" my life at the beginning of each new year - making resolutions, setting goals, etc. 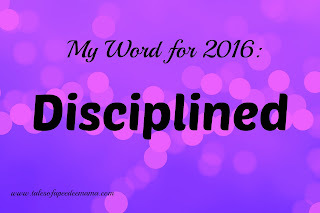 This year I decided to do the One Word for the year that has become popular recently. 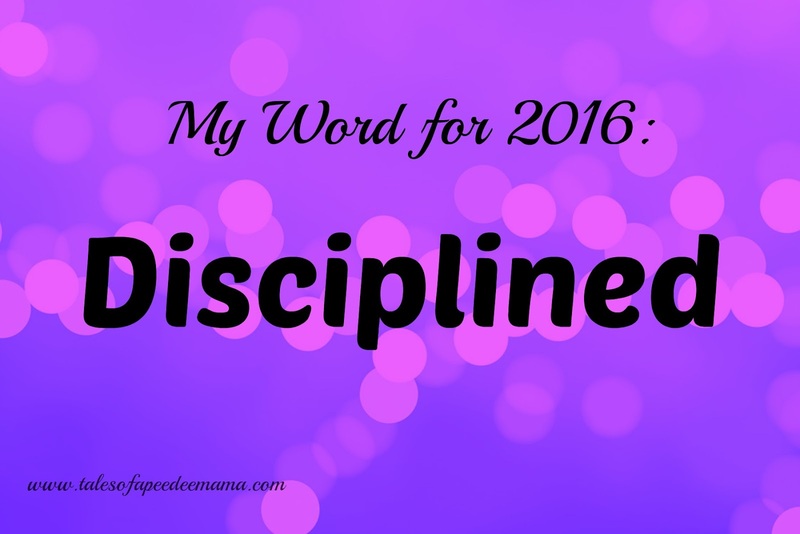 There are so many aspects of my life in which I need to become more disciplined. With 5 children, homeschooling, running to extracurricular activities, maintaining the house, etc., my life can easily feel like it is out of control. In fact, there are many days where I feel out of control. Homeschooling - I need to do a better job of keeping up with grading their papers in a timely manner, following up with areas where they need more instruction, and filing papers each week. Our Home - After living in this house for almost 8 years, it definitely needs some serious decluttering. I know there are items in some of the closets that have been in there the entire time we've lived here without ever being used, or even thought about. Academic Tutoring Business - As a stay-at-home homeschooling mama, I don't have a very large salary (read: NONE). Many years ago, I used to make a little extra money by tutoring in the afternoons. Now that all of my children are old enough that I don't need to watch them every single moment of the day, I plan to start tutoring again this year. Spiritual - I'm starting a read-through-the-Bible plan that will have me read through the entire Old Testament once and the New Testament twice over this year and next year. I need to be disciplined to keep up with my reading every day. Relationships - I need to be more disciplined in scheduling one-on-one time with my husband, my children, and my friends. I always have good intentions of doing things with the important people in my life, but I often lack the discipline to actually make that happen. Personal Growth - I plan to read more this year. (See the reading challenges that I've signed up for - here, here, and here.) I also want to do more crafting: finish Sassy's Christmas stocking, start some other cross stitch projects, get back into scrapbooking, and learn to knit.